Join the Lycoming County SPCA at New Trail Brewing Company for a drooling good time. Leash up your canine best friend and bring ’em along for the ride. 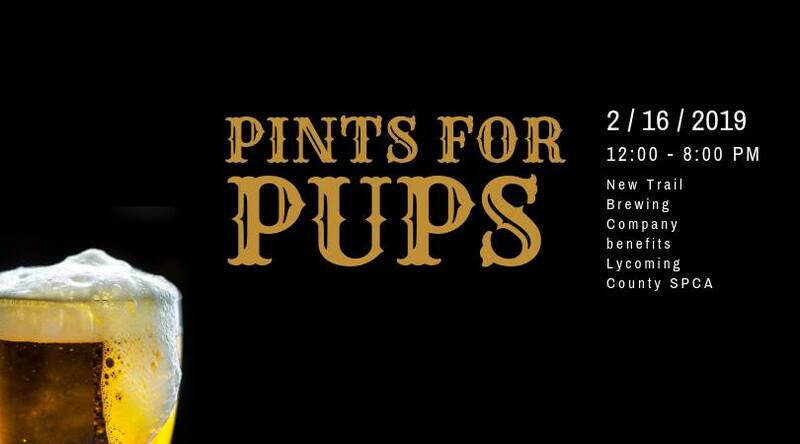 New Trail will be donating $0.25 per pint sold from 12-4 p.m. to the Lycoming County SPCA. (The tasting room will be open until 8 p.m.) The SPCA will have a treat for any visiting pup! Sneak Peak: This will be the first event that the SPCA’s Phillies Game raffle tickets will be available for purchase. More details coming February 11th! Our mission is to protect all domestic animals by: providing shelter, emergency treatment, investigation and prosecution of cruelty or abuse complaints; adoption and counseling; education programs; and humane care through Lycoming County.